Extra Subst - program designed to make access to frequently used folders of your computer easier. It is also used to create, edit and remove virtual drives of your computer. Extra Subst creates virtual drives on the basis of selected folders. 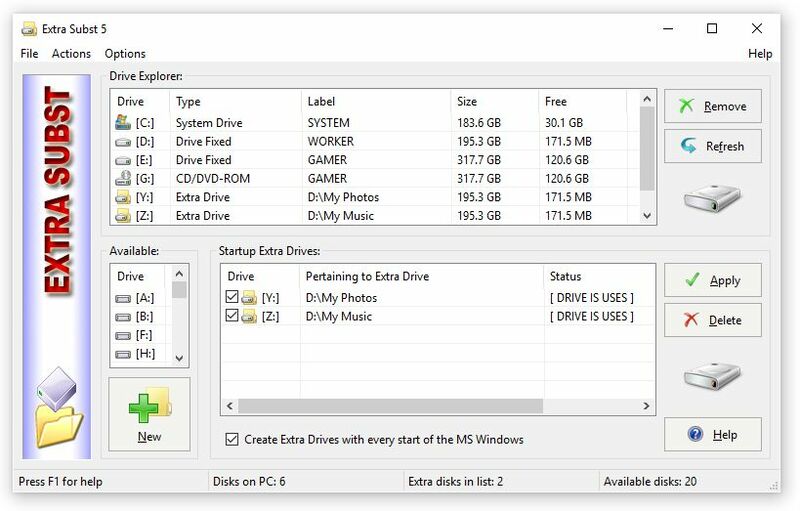 Physical drives remain unchanged and are not divided into additional partitions. Example 1: By default the folder "My Documents" is situated in the operational system "MS Windows XP" rather uncomfortably: "C:\Documents and Settings\User Name\My Documents\" With the help of the program "Extra Subst" you can create a virtual drive - for example drive "R:\" and select "My Documents" folder. After that, in your system the drive "R:\" will appear in which your documents will be kept. To access your documents you just click the drive icon "R:\" and there is no need to look for it in a folders tree. Example 2: You can create virtual drives for any folders with which you work often. For example, you can create drive "M:\" for the folder with your musical files "d:\archive\music\", drive "V:\" for the folder with your video files "d:\archive\music\" or drive "G:\" for the folder with your games and you do not need to divide your hard drive into additional partitions for that. Example 3: If you a web-designer you can make your project folder as a separate drive. In that case your project will be the same as if it were on Internet server.